Detective Conan, also known as Case Closed, is a popular Japanese manga series in Asia and Europe. It is a brainchild of Gosho Aoyama who was born in Daiei town, now known as Hokuei town in Tottori, Japan. Interestingly, his birthplace is now transformed into Conan Town, brimming with Conan characters, from charming stone monuments to bronze statues, manholes, etc. It’s literally a Conan paradise! Everywhere you turn, there’s a Conan character that will greet you! And most of the Conan attractions here are FREE! In fact, Conan walking tour (Conan Sightseeing) is now a popular activity of tourists traveling to Tottori, and it’s easy to understand why. Recently, I visited Tottori Prefecture, and even though I didn’t get to watch the Detective Conan series (Don’t judge me, I’ll explain! Haha), I was pretty excited to visit Conan town. I can’t remember exactly when Detective Conan was first aired in the Philippines, but I think around 2001 on GMA channel. But then that time I was already in college, and since I stayed in a dorm inside my university campus with no TV in the room, I never got to watch Detective Conan anime. While there’s a TV in our dorm’s lobby and some of my dormmates have the luxury of time to watch Detective Conan, I don’t. I spent my spare time working as a student assistant in the main library. Yes, my college life was pretty serious – school then work at the library then back to dorm to study and sleep! Haha But, I am aware of Detective Conan, and I wish I watched it like how I went gaga over another Japanese anime – Yuyu Hakusho (Ghost Fighter). 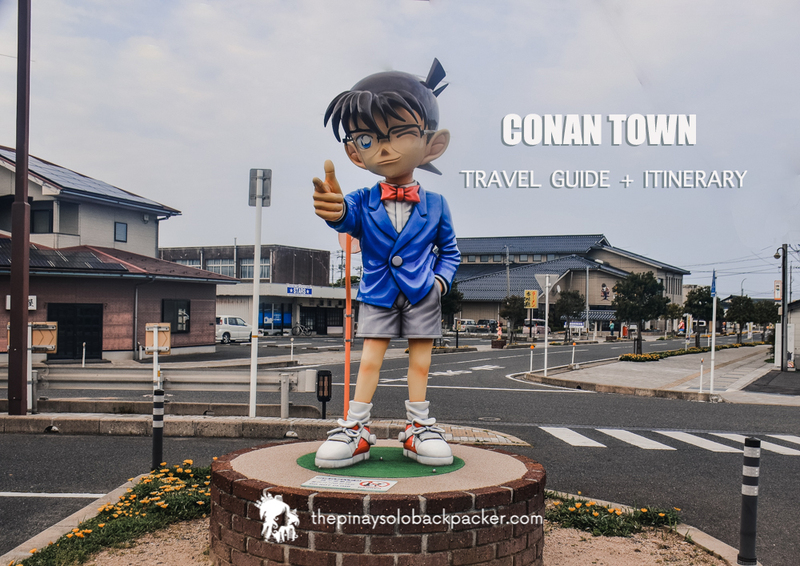 Anyway, to help you plan your trip to Conan Town in Tottori, here’s a quick Conan Town travel guide. Detective Conan is a manga series that tells the story of a first-grade boy (Conan Edogawa) who solves challenging cases one after another using different inventions and his struggle against the Black Organization. Like I mentioned above, Conan was created by manga artist Gosho Aoyama who hails from Tottori Prefecture. Its manga debut in 1994 and 2 years later, it was broadcasted as an anime. The English version was renamed to Case Closed due to some legal issues. Detective Conan is so famous that the manga has now 87 volumes translated and sold in 25 countries and the anime is aired in 40 countries. Conan town is pretty accessible from Tottori City. You can also go to Conan town from Osaka. 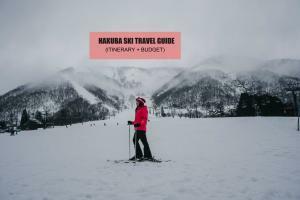 I have a detailed guide on how to get there if you are coming from Osaka. You can read the link below. 1. In Tottori City, go to Tottori Station and ride the JR San-in Line for Yonago. 2. Alight at Yura Station (Conan Station), it’s the 11th stop. 1.Take the train to Kurayoshi. Travel time is about 30 minutes. 2.Transfer to JR San-in Line for Yonago. Travel time is about 15 minutes. 3.Alight at Yura Station (Conan Station). Travel time: Depending on the type of train, could take 45 – 90 minutes. Note that all of these attractions are walking distance of each other and can be reached on foot from Yura Station (Conan Station). 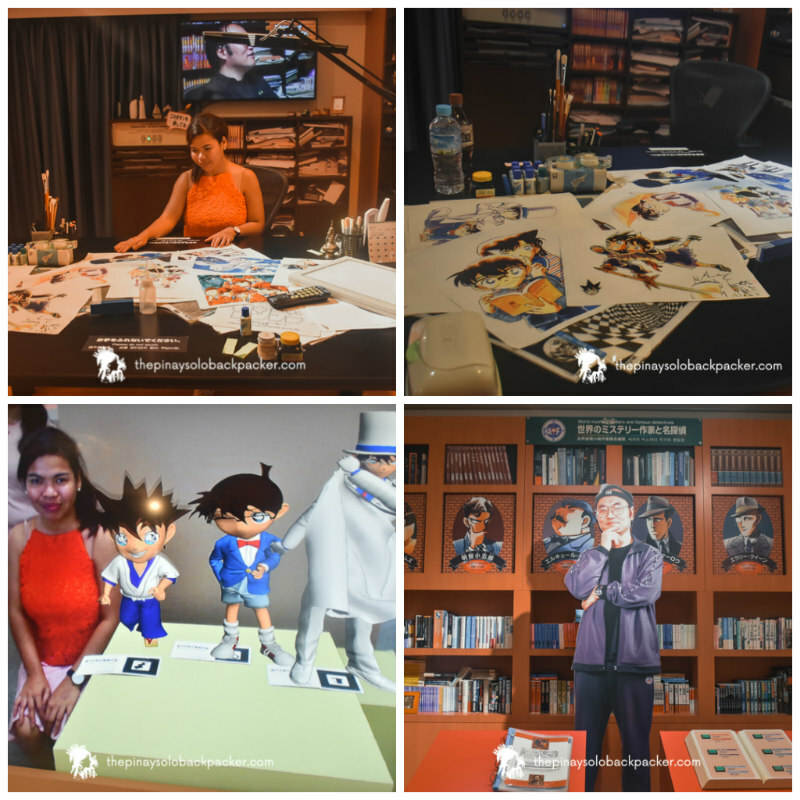 All attractions mentioned below are free except for the Gosho Aoyama Manga Factory and based on my experience this attraction is a must-visit, the entrance fee is worth it. You can get a Conan town map at the tourism office beside the Conan train station. The Conan train station is illustrated with Conan characters, from the window to the ceiling, from the seats to the lockers. 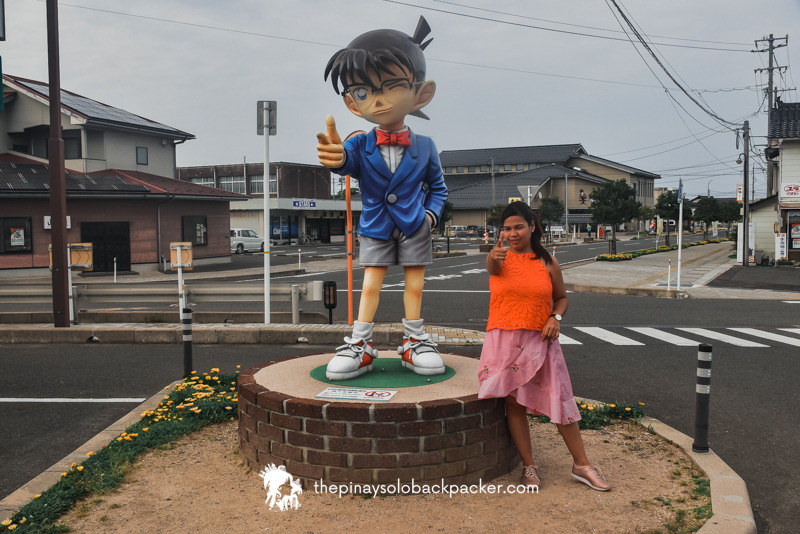 Outside, there’s a bronze statue of Detective Conan as well as a gigantic Conan stone monument. We also chanced upon a Conan taxi parked outside one of the houses nearby. Beside the train station is a tourism center, selling all kinds of Conan stuff – shirts, fans, stickers, books, etc. You can also borrow some books from Detective Conan series and read it there. Just outside the Conan train station is the Conan Street. 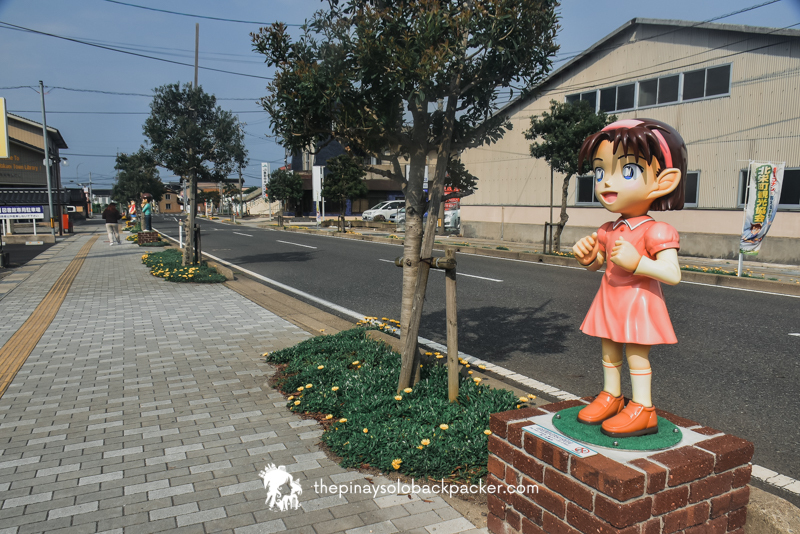 As you might have surmised, this street is sprinkled with life-sized statues of Conan characters, particularly the Junior Detective League (Detective Boys) like Mitsuhiko Tsubaraya (Mitch Tennison), Ayumi Yoshida (Amy Yeager), Genta Kojima (George Kaminski) and Ai Haibara (Vi Graythorn/Anita Hailey). There are about 13 bronze statues of 12 kinds, 24 stone panels and 44 Conan-designed manhole covers at Conan Street alone. The stone panels have Conan illustrations carved on colored black granite. Even the public comfort room has Conan characters. Also check out the Hokuei Town Library here. On the way to Conan Bridge, you’ll encounter about 6 Conan bronze statues of 5 kinds and rails with 12 reliefs of 4 kinds. Not really a short walk to the Gosho Aoyoama Manga Factory, but you will barely notice it since there’s a lot of photo opportunities along the way! Beika Shopping Street is the place to be if you want to bring home Detective Conan Souvenirs. Here, bronze statues of Schinichi Kudo and Ran Mouri will welcome you. Don’t miss the Detective Conan manhole nearby. You’ll find all the things illustrated or designed with Conan in kind, shirts, mugs, key chains, ref magnet, socks, stuff toys, puzzles, cookies, etc. There are also restaurants here in case you’re hungry. The town by the way is sprinkled with vending machines, so if your thirsty, you can easily buy drinks. *If you are 20 in a group, there’s a JPY 100/PHP 48/USD 0.89/EURO 0.77/SGD 1/MYR 4 discount for each ticket. The highlight of my Conan Town trip is the Gosho Aoyama Manga Factory , about 20-minute walk from Conan Station or 5 minutes by taxi. 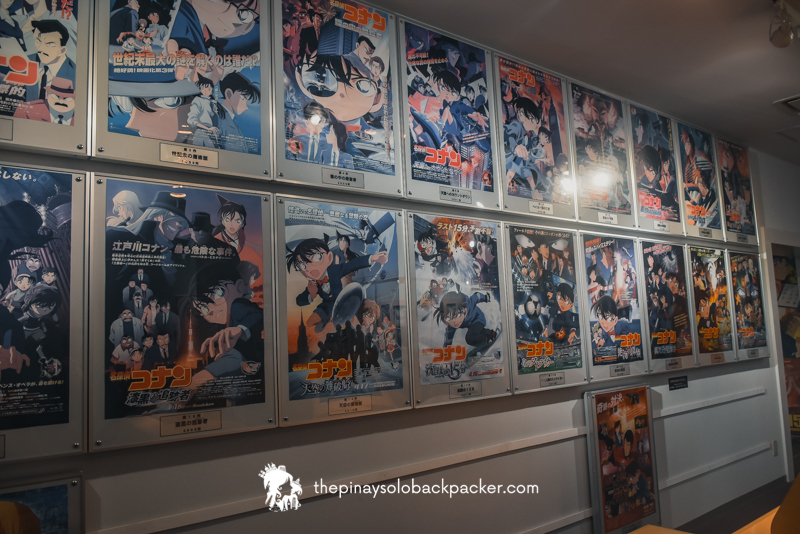 Opened in 2007, this is sort of an interactive museum showcasing everything you need to know about his creator, Gosho Aoyama, his manga works including Conan tricks that are recreated here. Don’t skip this when in Conan town! 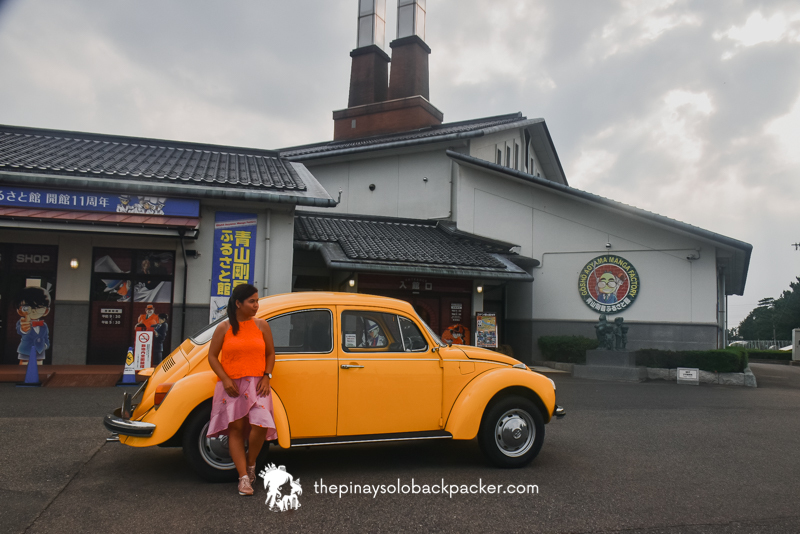 At the entrance of Gosho Aoyama Manga Factory, you’ll be welcomed by the yellow beetle of Professor Agasa. 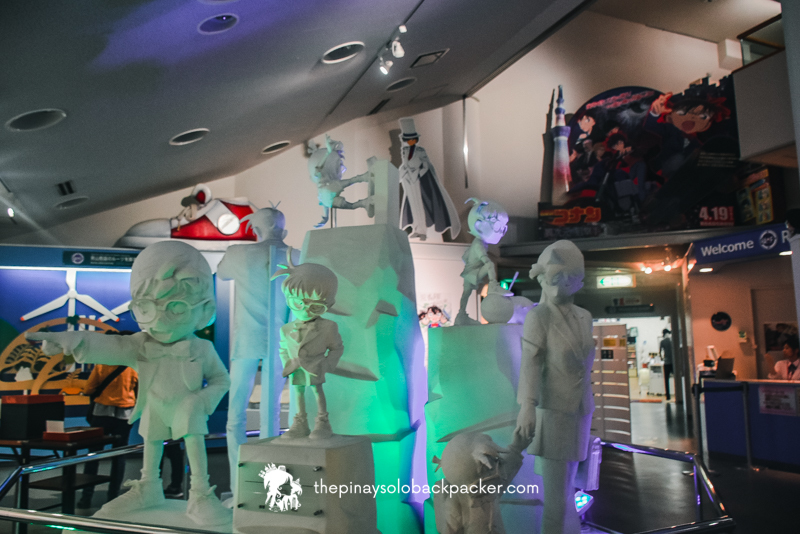 And upon entering the manga factory, you’ll see the white model of Conan characters illuminated with different colors. The first section of the museum narrates the history of Gosho Aoyama and his love for detectives since he was a kid. You’ll also encounter here the traces of Gosho Aoyama during his life at Hokuei Town and when he created Detective Conan including his history as a successful manga artist. Apparently, Detective Conan started after his publications of other manga series such as Magic Kaito and Yaiba. The process of how Detective Conan was created including original drafts of his works are also displayed in Gosho Aoyama Manga Factory. You can take photos but not close up shots of the artist’s drawings. We took part in the quizzes and games, if you have the Conan Passport, you can stamp it there. Like I said, this manga factory is peppered with statues, photos, manga books and exhibits of Conan and other works of Gosho Aoyama. You can even sit on his chair, in his recreated office here! But personally, the most exciting part of Gosho Aoyama Manga Factory for me is the interactive part of the museum where you can experience the different inventions of Dr. Hirosha Agasa. There’s the Voice-Changing Bowtie where you can change your voice like how Conan disguises himself as an adult. There’s also a Turbo-Engine Skateboard, which Conan uses when running after criminal. You can hop on the skateboard and experience pursuing criminals like Conan. Another interesting section is the corner showcasing how Conan performs varied tricks just like in the manga series. You can try them here! Lastly, there’s also a souvenir shop here that sells everything Conan, different stuff like puzzles, towels, shirts, socks, pens, ref magnet, toys, etc. Outside the Gosho Aoyama Manga Factory there are Conan statues and stone panels, we had fun taking some photos here with the super friendly and helpful manager of this manga factory. 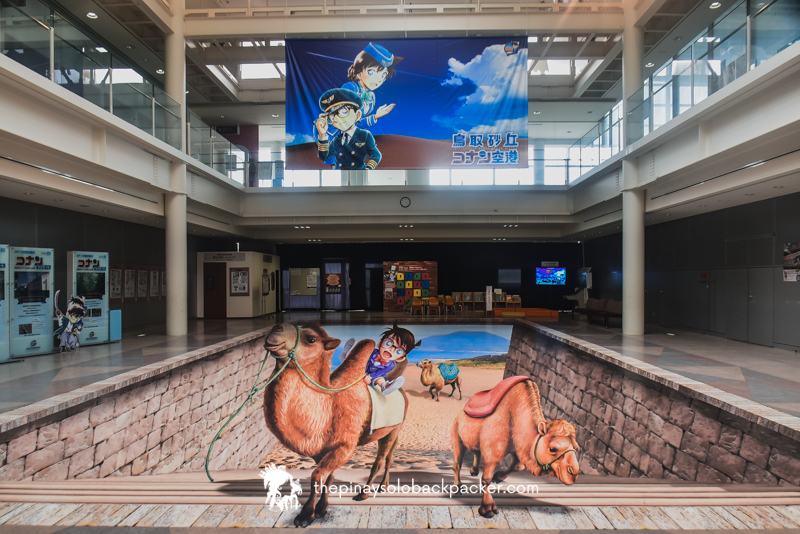 While you are in Tottori, you can also visit the Tottori Sand Dunes Conan Airport. It’s a real, working airport brimming with Conan characters – posters, standees, 3D painting and life-size statues! You can play interactive games here too! 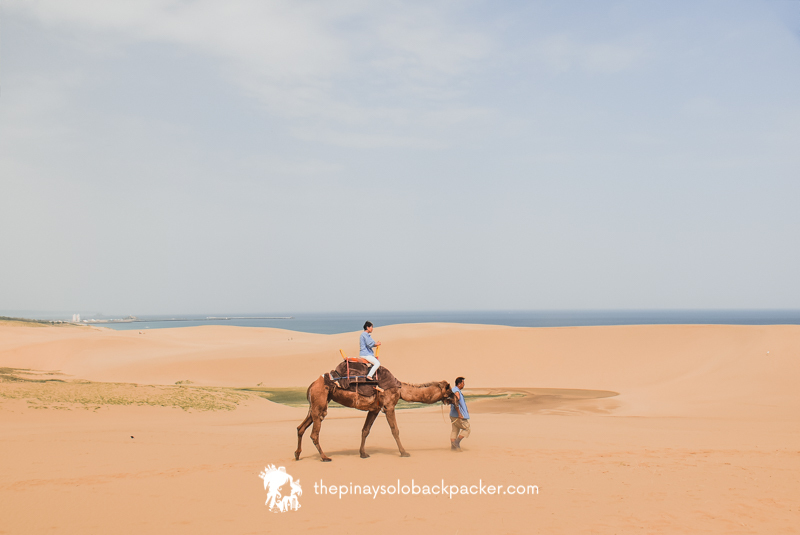 The biggest sand dunes in Japan, you can ride a camel, go sand boarding or paragliding. 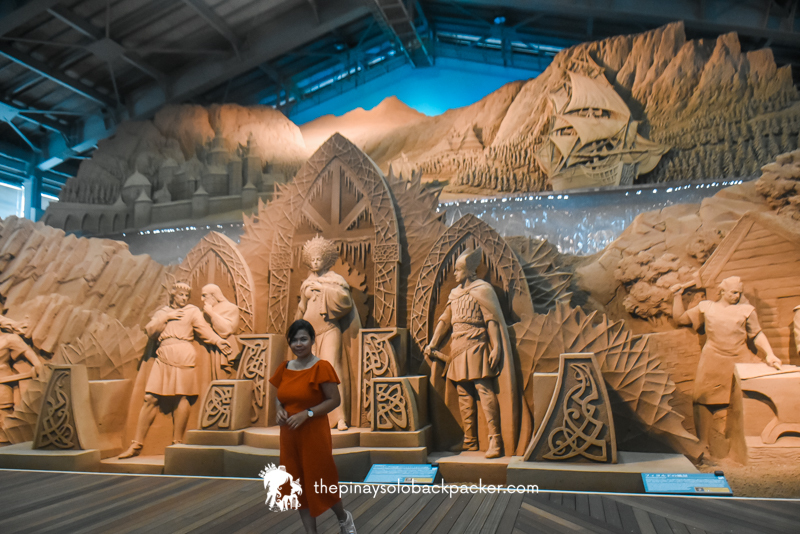 Nearby Tottori Sand Castle is Tottori Castle Sand Museum, Japan’s only open-air museum displaying sculptures made from sand. The sand sculptors are from around the world. This is where we stayed at during our trip to Tottori. It’s walking distance to Tottori Bus Station. It’s also near some good restaurants, convenience store and shopping area. The room is small but clean, with refrigerator and sink, TV and hot and cold shower. There’s a free coffee, milk tea, hot chocolate and water at the lobby. Staff are really helpful and attentive. We didn’t stay here, we only paid a visit. But I really like the smell and the ambience of this hotel. If I will return to Tottori, I would love to stay here. 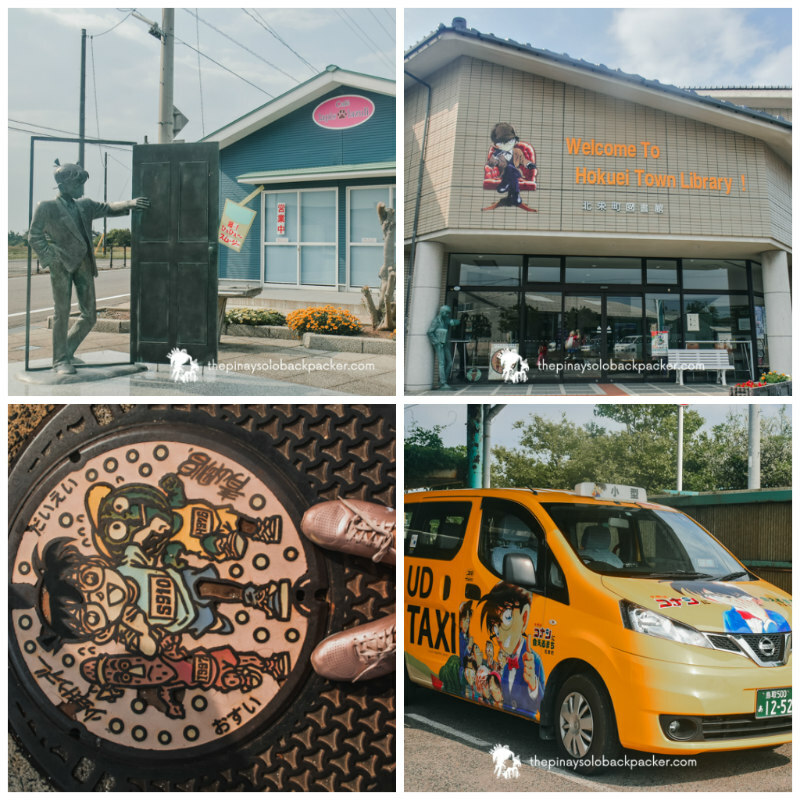 It’s just in front of Hotel Resh, the hotel is also walking distance to Tottori Bus Station and Tottori JR Station. Pretty convenient. I didn’t stay here, only paid a visit. If you want to experience a traditional Japanese hotel in Tottori, this is the place to be. 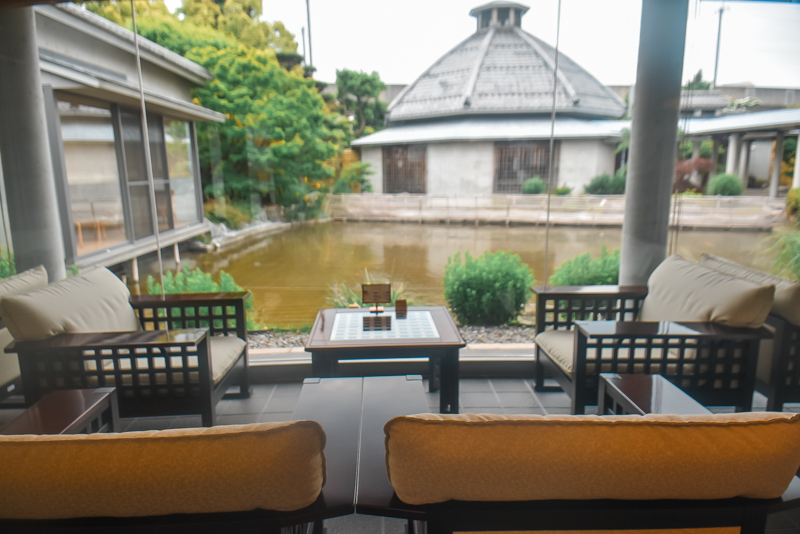 It has 2 private onsen that guests can use and they also have ryokan rooms. This hotel is right beside the Tottori Bus Station. It’s very near the Tottori JR Station as well. 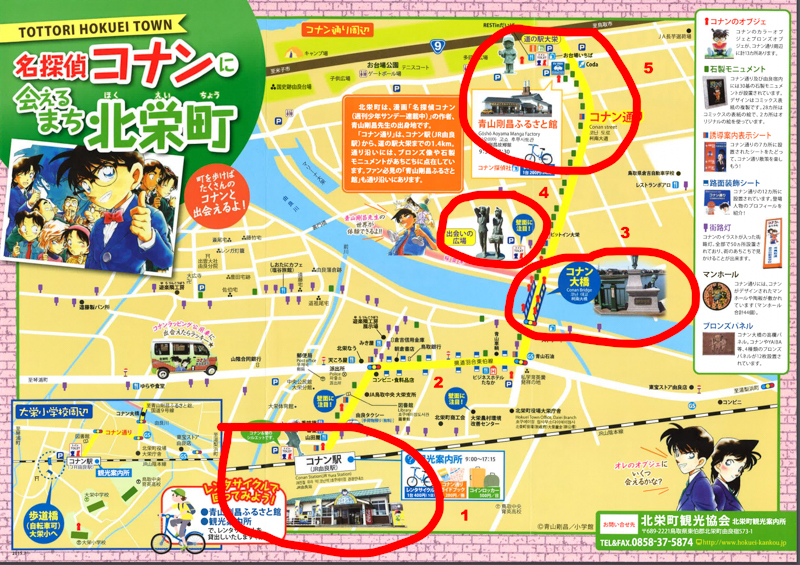 Here’s a sample Conan town itinerary with budget. Feel free to tweak this depending on your schedule. 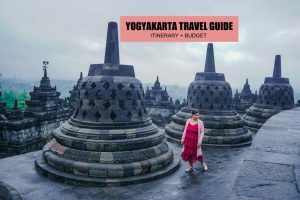 Budget doesn’t include food and souvenirs. This sample itinerary is good for a solo traveler or group travelers. 09:32 AM Alight at Yura Station (Conan Station). Start exploring + photo op. 09:40 AM Walk to Conan Tourist Information Center, beside train station. Get a map. 10:10 AM Walk to Conan Bridge. Photo op. 02:30 PM Walk back to Yura Station (Conan Station). Bring enough cash (Japanese Yen), there’s no ATM nearby. Get a map at the Tourist Information enter so you can maximize your time in Conan town. Buy drinks from the vending machine, cheaper than buying from shops or restaurant.